“This surprising finding may be an important clue to understanding those mysterious parts of the universe that make up 95 percent of everything and don’t emit light, such as dark energy, dark matter and dark radiation,” said study leader and Nobel Laureate Adam Riess of the Space Telescope Science Institute and Johns Hopkins University, both in Baltimore, Maryland. 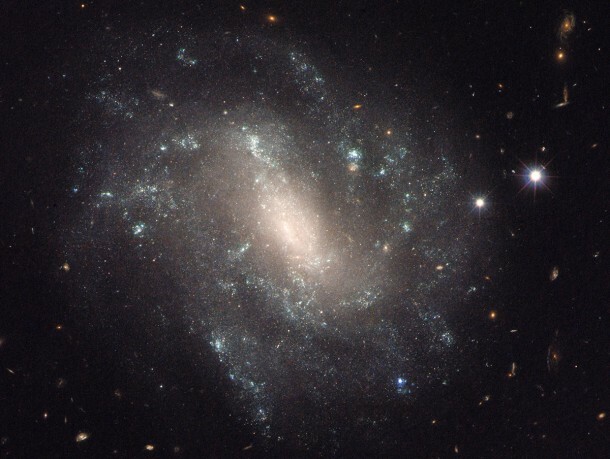 The team compared those distances with the expansion of space as measured by the stretching of light from receding galaxies. They used these two values to calculate how fast the universe expands with time, or the Hubble constant. The improved Hubble constant value 45.5 miles per second per megaparsec. (A megaparsec equals 3.26 million light-years.) The new value means the distance between cosmic objects will double in another 9.8 billion years. This refined calibration presents a puzzle, however, because it does not quite match the expansion rate predicted for the universe from its trajectory seen shortly after the Big Bang. 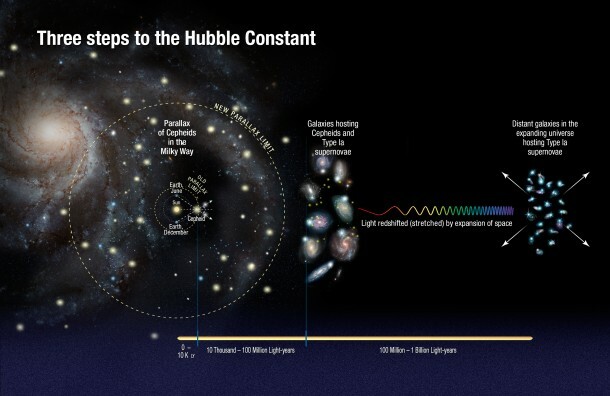 Measurements of the afterglow from the Big Bang by NASA’s Wilkinson Microwave Anisotropy Probe (WMAP) and the European Space Agency’s Planck satellite mission yield predictions which are 5 percent and 9 percent smaller for the Hubble constant, respectively. The SH0ES team is still using Hubble to reduce the uncertainty in the Hubble constant even more, with a goal to reach an accuracy of 1 percent. Current telescopes such as the European Space Agency’s Gaia satellite, and future telescopes such as the James Webb Space Telescope (JWST), an infrared observatory, and the Wide Field Infrared Survey Telescope (WFIRST), also could help astronomers make better measurements of the expansion rate.